Earlier last week, on a warmish night, I stepped outside to check the porch light for moths and bring raven in from her tie-out and nearly stepped on this little guy, who was sitting still as a leaf on the wooden porch decking. I was a little surprised to see him. I keep emphasizing that there is no substantial body of water anywhere near the house (Raven’s drinking bowl doesn’t count) and I’m always surprised to see aquatic or semi-aquatic creatures turn up there. Since the frogs started calling this spring I’ve determined that there’s a vernal forest pool in the neighbour’s forest, almost due west (or at least, at straight right-angles from the house; not sure how west lines up). That’s the closest pool of water with any frog potential, and it’s still probably 90 meters (295 ft) at a minimum, which is a long way for a little frog not much bigger than the last joint of my thumb to hop. Maybe the other frogs were picking on him for the imperfect cross pattern on his back. Or maybe it was a she and she was just feeling overwhelmed by the testosterone and needed to escape for a breather. In any case, it only stuck around long enough for me to take one photo before jumping off the porch and disappearing into the darkness of the garden. Always have enjoyed the sound of peepers — to me a true sign of Spring. 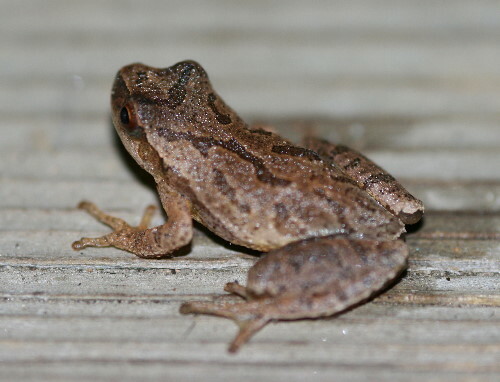 Your great photo gives me an idea of what to look for — would love to see a peeper on my deck. Great photo!